On the island of Maui a visitor can find a taste of all things Hawaii. The island has something for everyone, from lush tropical bamboo forests draped with waterfalls, to soaring barren volcanic peaks well above tree-line. What you’ll find between these two extremes is a cross section of diversity unmatched on any of the other islands in Hawaii. All of this diversity of adventures is accessible to you in a standard rental car. 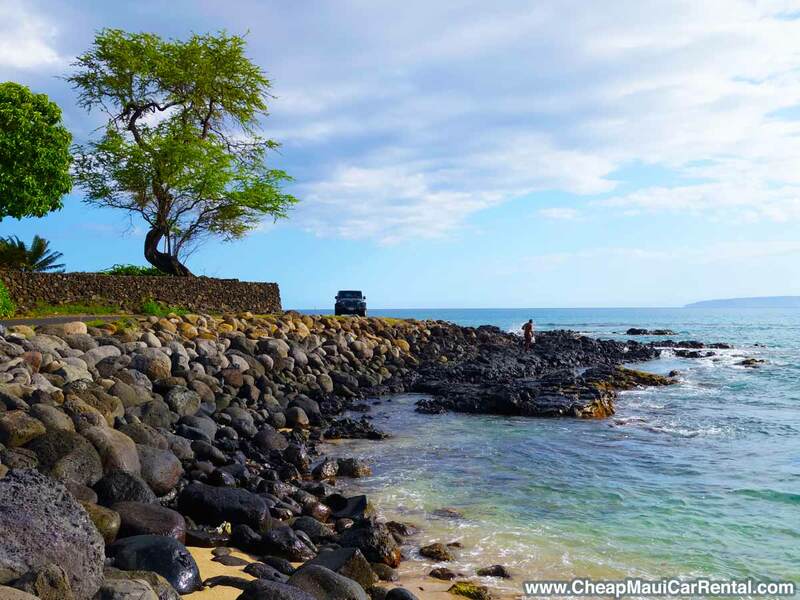 There’s no need for special travel arrangements or off-road vehicles, as there are only a few unpaved roads on Maui that are off-limits for rental car travel. Central Maui is home to Kahului, Maui’s main population center, where most flights arrive. This area features plenty of shopping, hotels, restaurants, and most of Maui’s rental car agencies. For a taste of vintage Hawaii, be sure to check out nearby historic Wailuku Town. Haleakalā dominates the eastern portion of Maui. The road up to this dormant volcano’s 10,023 ft summit and it’s massive crater is paved and open to rental cars. Just remember to dress in layers, as you will be passing through a wide range of climate zones on the way to the top, where you may find it cold, raining, and windy, or simply sunny, cool, and breezy, depending on the time of year. From tropical sea level the 37 mile journey generally takes about two hours. Along the way visitors will enjoy sweeping views, rare plants and wildlife, and rapidly changing weather. Near the summit the vegetation gives way to a barren, rocky moonscape. Maui’s North shore is pure tropical island perfection. Draped across the landscape are lush valleys dripping with waterfalls and filled with forests thick with huge bamboo, ferns, beautiful flowers, and multicolored rainbow eucalyptus. Below these valleys is a coast of sandy beaches and rocky shoreline splashed with warm waves. The best way to experience this natural bounty is by driving the 55 mile road to Hana. Don’t underestimate the time needed for this trip. The road is narrow and winding, speeds will be low, and navigating will require your full attention. Maui’s South Shore (pictured above) has everything you expect in a traditional Hawaiian vacation. Beaches, sunshine, condos, golf resorts, and more sunshine. Following the coast highway further south past the resort area will lead you to Makena State Park with it’s wide sandy beaches, and Ahihi Kanau Natural Area Reserve where visitors can explore a rocky lava flow that extends into the ocean. Upcountry Maui, on the west-facing slopes of Haleakalā, is the source of much of Maui’s bounty. Ranches, farms, and vineyards dot the landscape, many of them open for tours. Visitors can sample locally made wines, cheeses, fruits, and vegetables. One of the highlights of upcountry Maui is the funky little town of Makawao, with it’s eclectic collection of shops, restaurants, and galleries. On a drive around West Maui from the south, visitors will travel through a dry, almost desert-like zone where dry grasses and cactus prevail. As the road follows the coast, gradually bending northward, the landscape and climate eventually transitions to more lush vegetation and a wetter climate. The shoreline in this area of West Maui is generally similar to the South Shore, with condos, resorts, and golf courses in abundance. The Kahekili Highway does circle around the North Shore of West Maui, but the road is narrow and rough, so rental cars are not permitted on this portion of the road. All the diversity of Maui is open to you. From jungles to deserts, beaches to soaring volcanic peaks, barren lava flows to abundant farms. All that’s needed to experience Maui is a rental car, a little free time, and an adventurous spirit.